In order to reach kindred status with the Lossoth without any serious grinding, I was relentless with my task turn-ins. The happy result of those turn-ins was two-fold; the desired effect of Lossoth reputation gain, and the unexpectedly wonderful reward of “Busy Bee” and its respective cloak. I had no idea how appropriate it would be for Eregion until I got there! Not only are the colors perfect for that zone, but if the Fine Clover Honey littering the landscape is any indication, this former elven stronghold must have the happiest bees in all of Middle Earth. When I reached this zone, I immediately ran down to the Walls of Moria so I could get my first Legendary Items. Good thing too, as this golden scale chest piece was given to me there and I think it matches the cloak well, both in texture and tone. I’ve been holding onto the gloves and boots for a while now, as golden accents seem a bit harder to find than silver. Now I finally had a reason to wear them! Gazing at the heights of Baranzinbar. I can’t believe how well the shoulders and chest piece go together- they even have the same delicate swirled shapes, and in the same soft beige color. 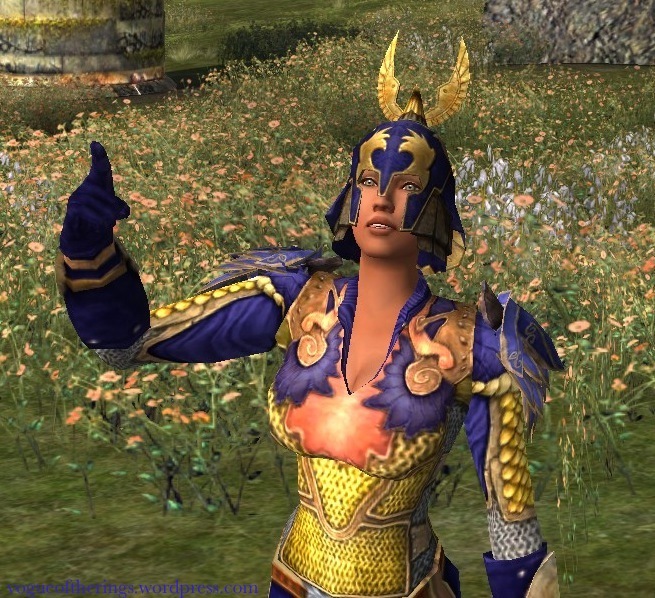 I had forgotten about the helm, but as I was searching through my inventory, and losing hope that I would find a helm that worked (again, the gold thing), I re-discovered this one! It fancies the outfit up nicely, I think. 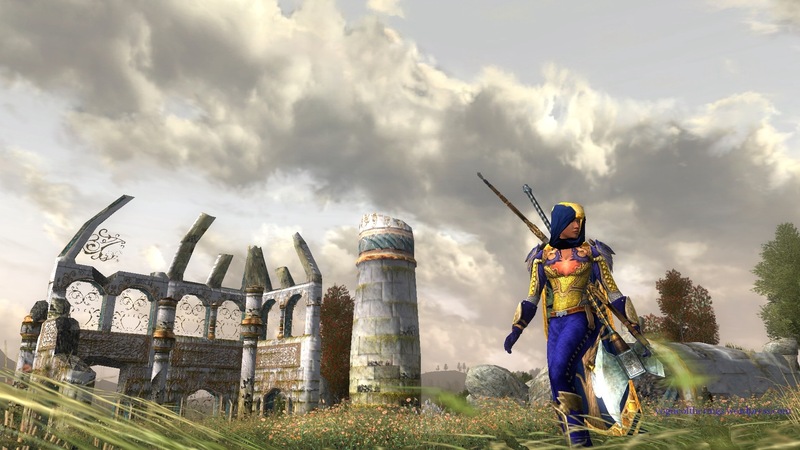 *Starry Mantle recently posted an outfit with gauntlets that look like this, so I found out they are also available as a skirmish barter or from the lotro store. Pausing a moment before passing though the Doors of Durin. *Takes a deep breath* Now into Moria I go! My hope is that by the time I leave its passages behind me, it is the Delving of the Dwarves once again. Update: Sometime after this post I found these leggings (Orlogfot, drop, also ered luin blue) that I preferred with the outfit. I love the bright blue and yellow — always an awesome combination! I do like cheerful. 🙂 This outfit is so bright and bold underneath the sky, but the black pit does it’s job and really dulls it down. Impressive matching of accent colors! 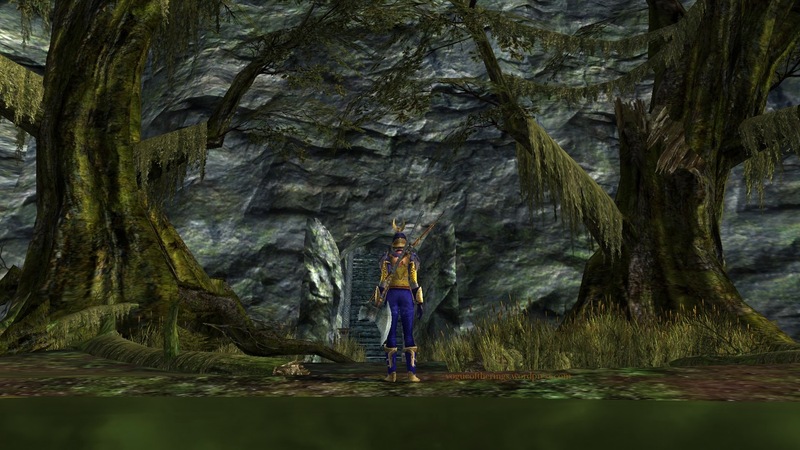 In contrast to Angmar, I found Eregion to be the most pleasant zone. I still stop and gaze at the horizon, like you are doing here! Hope you are liking Moria, and have a goat to ride already. That makes a difference! I do have a goat! I cannot imagine this place without one. I would pull out my freaking hair. The Treasure Hunt happened *right* before I went into Moria, and when I found out a superior goat was one of the prizes, I promptly cleared a morning and strapped in, determined to dig for treasure until I got one. Phew, you lucked out there! Or maybe you can’t call it luck to work hours for the thing, but I heard of people who didn’t get much of anything for similar effort. I keep forgetting I don’t have the cave claw horse either. Can’t say I’m crying over it. I actually saw two of them hitched to a wagon that some orcs were using near Galtrev. It seemed somewhat appropriate, I guess. 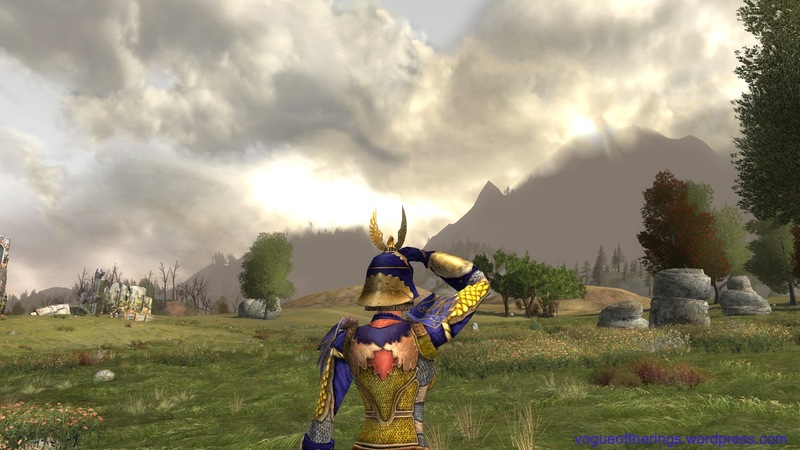 Oh, that helmet is very nice:) I have to look out for it next time I do the epic quest line. 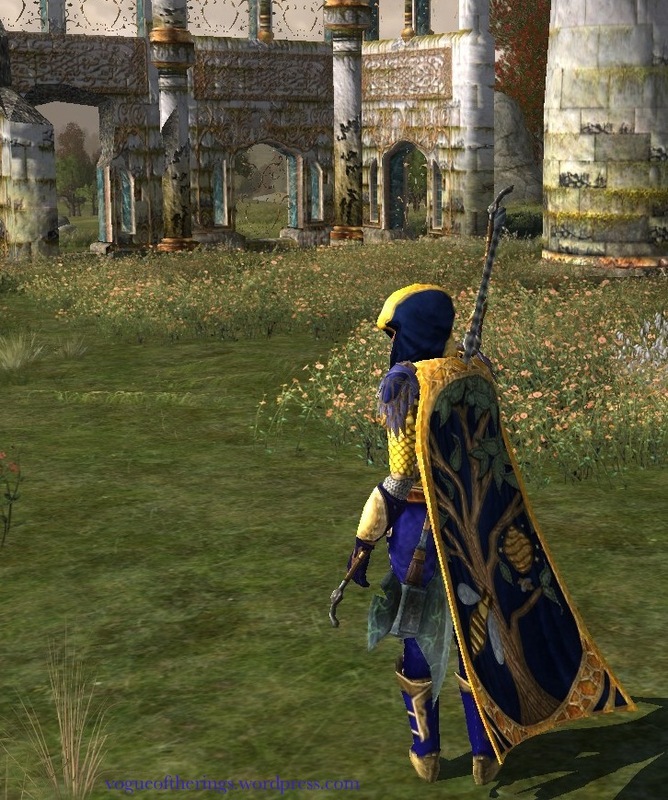 You can also get a cosmetic version of Himhar in the lotro store.